The law partner of the President of Cyprus is under investigation in Cyprus and in New York for allegedly concealing assets, cashflows, and money-laundering, and for lying to a Cyprus court and to the Cyprus Ministry of Interior, for the benefit of a former Russian politician now on the run. Theofanis Philippou (lead image, left) has been the long-time business partner of Nicos Anastasiades (centre), who left his Cyprus law firm, Anastasiades & Partners, in 2013 to win election as President of Cyprus. 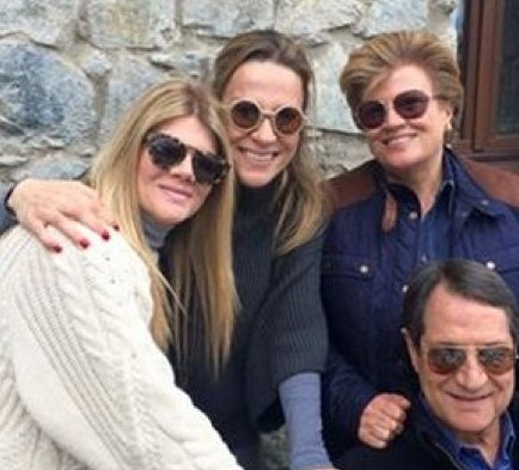 His two daughters, Elsa and Ino Anastasiades, remain in charge of the law firm, along with Philippou. Philippou has been identified as a key witness in a $2 billion claim in the New York Supreme Court. Leonid Lebedev (right) is the claimant in New York, where his court filing says he is a Russian citizen. In Cyprus Lebedev appears in government records as having been granted Cyprus citizenship in the spring of 2011 by the state Ministerial Council. He qualified, according to the Council record, with €11.5 million in assets on the island. At the time, Lebedev was the multi-term senator for the republic of Chuvashia in the Federation Council, which is the upper house of the Russian parliament. To evade the 2002 Russian law on foreign passport holders serving in parliament, he concealed his Cyprus citizenship. Lebedev left the Senate in April 2015, and the country shortly afterwards. At the same time Philippou was director of the company which is at the heart of the New York litgation, Coral Petroleum; this is registered in Ireland and operated in Switzerland. According to lawyers close to the New York case, and to Cyprus government investigators, Philippou and Anastasiades — father until 2013, his two daughters since then – are involved in the movement of money Lebedev is suing for in the US. Lebedev is charging in the New York (State) Supreme Court that he is owed $2 billion for a 15% shareholding in the oilfields of the Tyumen Neftegas Company (TNK) which he sold to Victor Vekselberg and Leonid Blavatnik. 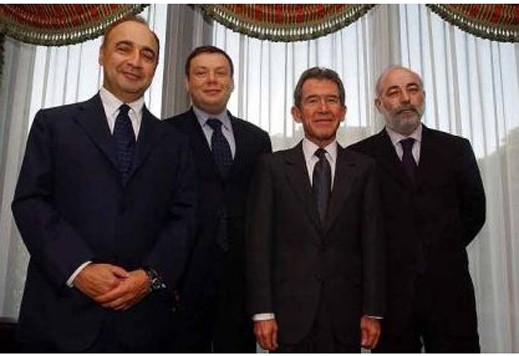 Blavatnik (1st left) and Vekselberg (right), with Mikhail Fridman (2nd) , co-owners of TNK, form the TNK-BP joint venture with BP chief executive, Lord John Browne (3rd) – February 2003. For the timeline of their relationship, read this. Vekselberg and Blavatnik have presented in court their agreement of 2003 in which they say they bought Lebedev’s shares for $600 million. They say Lebedev’s company Coral Petroleum was paid the money by their company, Rochester Resources, registered in British Virgin Islands, over two years. By September 2005, they say the entire amount had been handed over to Coral Petroleum through an associated company, Agragorn, whose shares were registered in the name of Imperium Nominees Ltd. That’s a Cyprus management company which at the time of the TNK share sale was controlled by Anastasiades and Philippou. For details of the UK High Court summary of what happened, read this. At paragraph 23 and footnote 20, Judge Jonathan Hirst confirmed it was also Lebedev’s testimony that the $600 million had been paid in instalments to Agragorn. Last December in Manhattan, Judge Salliann Scarpulla (right) dismissed Lebedev’s accusations of fraud against Vekselberg and Blavatnik, leaving one issue to be tried and adjudicated. This is Lebedev’s claim of breach of the 2003 contract. That part of Scarpulla’s judgement is now being appealed, as Vekselberg’s and Blavatnik’s lawyers argue there is no case left. Read their argument here. Philippou has become the central witness because he has been the senior director of Coral Petroleum since April 2012. He took over Coral Petroleum after its director in Switzerland, Martin Bartek, reportedly killed himself in April 2011. For that story, read this. Bartek had been responsible, according to Swiss sources, for taking Lebedev’s instructions for moving funds from Coral Petroleum on to Cyprus entities, also controlled by Lebedev and supervised by Philippou. In April 2012 Philippou is on record as testifying in a Cyprus court that he was the personal lawyer of Lebedev. Lebedev, Philippou himself, Imperium Nominees, and two Cyprus companies were the defendants in a lawsuit by Commerzbank for recovery of $180 million in an alleged loan fraud. Investigation by Cyprus officials is under way to determine what role Philippou, the Anastasiades law firm, and associated management firms including Imperium Nominees, performed when Lebedev applied for his Cyprus citizenship and passport. The basis for the application was Lebedev’s documentation of his business, personal, and trust bank accounts in Cyprus, plus Cyprus companies whose assets he told the government he controlled. The Cyprus rules for citizenship by investment have been relaxed since 2014, lowering the amount of money required. In 2011, when Lebedev was applying, the cash minimum to qualify was €5 million. The application was granted in March 2011, and Lebedev’s Cyprus passport, number K00012041, was issued on March 29, 2011. 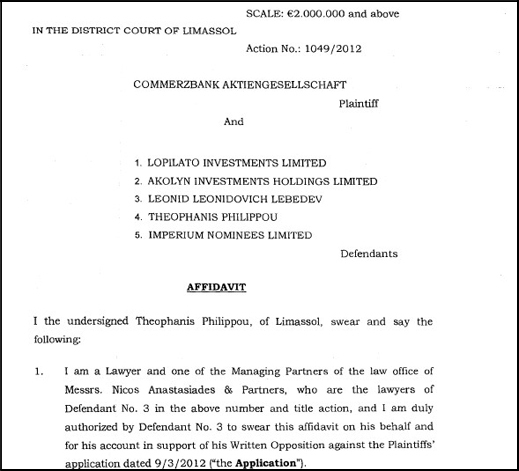 At the time, Philippou was a managing partner of the Anastasiades law firm; so was Anastasiades himself. His daughters Ino and Elsa were also partners in the firm. At the time in 2011, Lebedev was a senator representing the republic of Chuvashia in the upper house of the Russian parliament, the Federation Council. That made Lebedev a “politically exposed person” (PEP) under the special rules and regulations of the Cyprus Government and the European Union. Designed to prevent politicians taking bribes and kickbacks, and laundering the proceeds into Cyprus bank accounts, the Central Bank of Cyprus issued these special measures in a circular to the Cyprus banks, dated March 29, 2002. How much were Lebedev and Philippou required to disclose in Cyprus of who exercised “ultimate control” of Coral Petroleum? Did they meet the disclosure requirement, or did they dissemble? Cyprus officials investigating Lebedev and Philippou refuse to answer questions about the probe. MOKAS, the government’s money-laundering unit, which reports to the Attorney-General of Cyprus, former judge Costas Clerides (right), has been asked by the Russian government to assist Russian prosecutors investigating charges of $240 million in fraud and theft from the electric utility, TGK-2, which Lebedev and his associates have controlled through Cyprus-registered shareholding entities since the state privatization of 2008. The dossier on Lebedev and on the lawyers from the Anastasiades law firm must be reviewed by Attorney-General Clerides. He must decide if crimes were committed against Cyprus law and if the evidence will stand up in court for prosecution. The evidence collected is also open to request by the US State Department, acting for the New York Supreme Court, when lawyers in the Lebedev case apply under the Hague Convention for the taking of evidence abroad. Russian Criminal Code offences by Lebedev have been alleged in requests from Moscow for assistance of the Cyprus Attorney-General, Minister of Justice, and Central Bank. The offences cited in the Russian documents include the Code articles 33, 159, and 201 – criminal conspiracy, embezzlement, and abuse of authority. In a proceeding in a Tver region court in December, the indictment of Lebedev’s subordinate at the TGK-2 company and at the Sintez holding, Andrei Korolev (right), was confirmed in a written judgement, along with a warrant for his arrest and his removal from the TGK-2 management. For the court documents, partially classified, which confirm these details, click to read. According to Judge Scarpulla’s ruling of last month (below), lawyers in the Lebedev case have until May 1 to file subpoenas for production of documents and witness testimony. 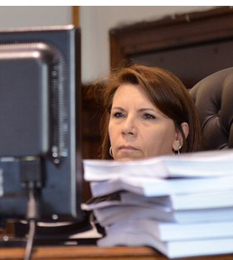 Witnesses must be questioned and their depositions completed by October 31. 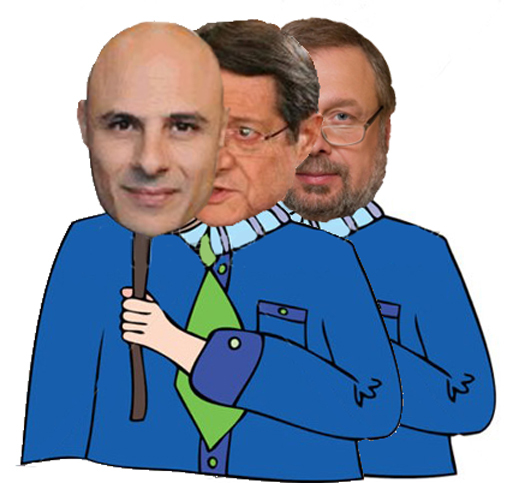 Philippou and Anastasiades are non-parties. But the questions about Coral Petroleum they may be requested to answer, and documents to produce, are central to the case. Judge Scarpulla’s decision on confidentiality appears not to classify what they are asked, what they say, nor the fact that their names may be on the witness list. According to the judge, “ ‘Confidential Information’ shall mean all Documents and Testimony, and all information contained therein, and other information designated as confidential, if such Documents or Testimony contains: (i) trade secrets; (ii) proprietary business information; (iii) competitively sensitive information; or (iv) other information the disclosure of which would, in the good faith judgment of the Party designating the material as confidential, be detrimental to the conduct of that Party’s business.” Lebedev has already sworn to the judge that he had no business with Coral Petroleum. On April 12, 2012, according to the records of the Limassol District Court, Philippou testifed on oath that he was “one of the Managing Partners of the law office of Messrs Nicos Anastasiades & Partners, who are the lawyers of Defendant no. 3 [Lebedev] in the above number and title action.” The case had been initiated by Commerzbank of Germany, which was accusing Lebedev of orchestrating loan and share fraud and refusing to repay $180 million. Lebedev’s defence was that the money had gone to companies with which he wasn’t connected; that Commerzbank’s dealings with them were none of his business; and that he owed nothing. Commerzbank lost its case in the Russian courts for lack of proof. This was Lebedev’s lie; Philippou’s perjury. According to the records of the Cyprus Ministerial Council, his application for citizenship had been approved more than a year before, with confirmation that he held €11.5 million in cash on account and other investments. 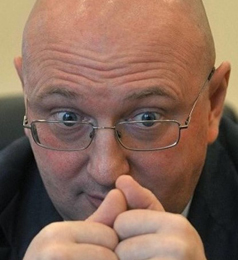 According to Cyprus sources, special arrangements were taken to keep Lebedev’s passport secret. A search for Lebedev’s Cyprus identity papers by his name corroborates what happened. Lebedev’s €11.5 million qualified him as a Cypriot businessman and property owner, a Cyprus national and passport holder. Philippou took over as the control director of Coral Petroleum from Bartek, according to the records in Dublin of Ireland’s Companies Registration Office (CRO). The CRO records show two front company operators in Dublin, Helen O’Donovan and Liam Grainger, had been nominal directors of Coral Petroleum between 1999 and 2012, but they took no executive or managerial role. O’Donovan is on Irish record as director at 687 Irish companies; 468 now defunct. Grainger has been the director of 411 Irish companies, 292 of which are defunct. Bartek, however, ran several businesses and several companies of the Sintez Group on Lebedev’s orders, according to Swiss police sources. A Swiss living in Geneva, Bartek (right) was the director of Coral Petroleum from February 11, 2003 to April 4, 2011. The first date is important because that placed Bartek in position as Lebedev’s manager when Coral Petroleum signed the TNK share sale and purchase agreement with Rochester Resources. The second date was the day of Bartek’s death, so he can’t testify. For more details of how his name arose in the UK High Court, see this story. According to UK High Court justice Jonathan Hirst, ruling in 2014, Bartek had been “a trusted friend and business colleague” of Lebedev’s. 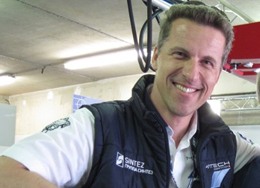 Bartek had depended on Lebedev for financing of his racing car team, Matech. For background, read this. When Lebedev cut off the cash, Bartek and Lebedev exchanged threats which were reported to the Swiss police, just before Bartek died. UK court records of the evidence from Lebedev, Vekselberg and Blavatnik show that Agragorn was associated with Coral Petroleum in the TNK share sale, holding 24 promissory notes to secure payment of the $600 million. It, too, was a front company, apparently under Philippou’s supervision through Imperium. It was registered in the British Virgin Islands (BVI) by a company services operator called Trident, Trident also created the nominal shareholder of Coral Petroleum, Mysto Ventures. Cyprus official sources acknowledge they know Agragorn is beneficially owned by Lebedev and supervised by Imperium. Philippou had merged his law practice with the Anastasiades firm in 2001. 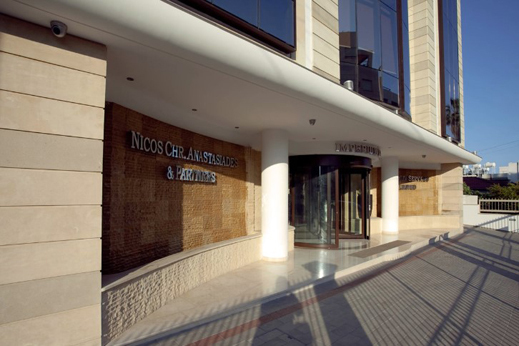 After Anastasiades moved into the Cyprus presidency in March 2013, Philippou stayed behind in Imperium Tower. He says he has halted their connection in business deals which he’s been pushing for government support of his offshore clients. In investigations by the Cyprus government and the Bar Association, Philippou promoted the bid by Irish air carrier Ryanair to acquire Cyprus Airways, after the Cyprus airline had been bankrupted by a €65 million penalty imposed by the European Commission in Brussels. In the Ryanair case, Philippou was accused of using lawyers from another Cyprus law firm to disguise his role in lobbying for government approval of the privatization of the airline in Ryanair’s favour. Anastasiades was cleared of involvement in the affair. 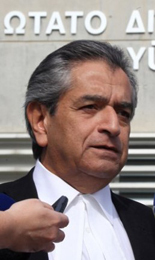 Attorney-General Clerides ruled that Philippou was in the clear for lack of proof. “Based on existing evidence, there does not appear to be cause to investigate a possible criminal offence by any person or legal entity”. The Ryanair deal was called off, and Cyprus Airways closed down in January 2015. Investigation of political corruption and fraud at the airline is continuing. Also continuing are official investigations of the role the Anastasiades law firm may have played in getting their clients’ money out of the Bank of Cyprus and Laiki Bank, before the European Commission, the European Central Bank, and the International Monetary Fund imposed the confiscation of bank depositor funds in March of 2013 to qualify the government for a €10 billion bailout. Details of the client list who have been accused of benefitting from insider information have been published in Greek.They include personal and company accounts of the Loutsios family, in-laws with the Anastasiades family by the marriage of Elsa Anastasiades. The Anastasiades and Loutsios families have denied the allegations of wrongdoing. Lawyers in the New York case refuse to say whether Philippou and other Cypriots will be sought for questioning. Lebedev let his Moscow spokesman go when he left the country, and he is now incommunicado in Los Angeles.